The importance of sustainability and protecting our environment is gaining momentum and more people are embracing green living. Sadly, many "green" products including kitchens are often more expensive due to low demand. However, there are lots of ways you can go green in your home and kitchen that will not only be kinder to the environment, but also save you money. According to The Kitchen Specialists Association, featuring at this year’s Decorex Cape Town, there are not many kitchen manufacturers doing green kitchens. It is therefore important that when planning your kitchen, you know what products you want them to include or exclude to make your kitchen as green as possible. The association has outlined a number of ways you can do this. Designing the kitchen to optimise natural light will reduce the amount of lighting you will need. Where possible place the key work areas like stoves and sinks close to a natural light source. Ensure all lighting is low voltage or energy saving bulbs. 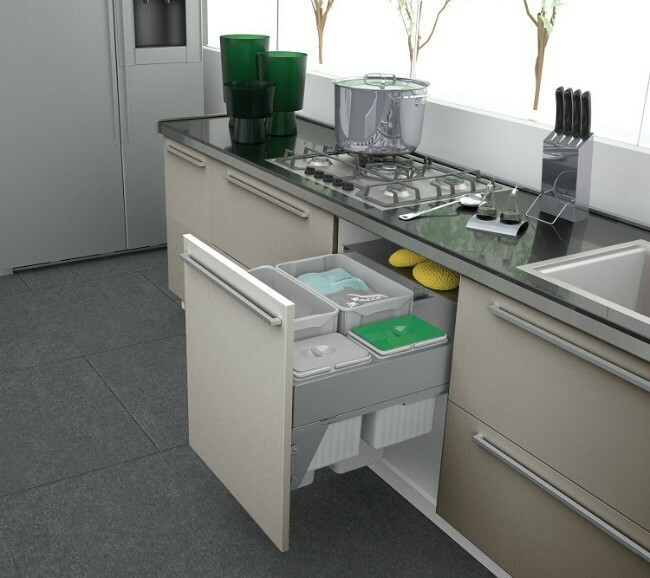 Ask the designer to include bins that will allow you to separate your recyclable waste easily. Look into including a waste disposal system or green bin for biodegradable waste that can be turned into compost. Give your kitchen a green look with planters of herbs. When it comes to the manufacture of your kitchen units, materials are available that have been manufactured in a more environmentally-friendly way. These materials will have a green stamp of approval by a green agency. While they might be more expensive it is worth asking for a quote using green stamp materials. Green kitchen carcass boards, for instance would contain less formaldehyde or, instead of the normal melamine chipboard, you could request carcasses made from bamboo - a more sustainable timber. MDF, the most common board used for manufacturing doors and drawer fronts is also available in various green ratings. When it comes to painting or 'duco' ensure the paint used is water-based and environmentally friendly. Advances in technology have made water-based paints as good, if not better, than their solvent based counterparts. The other option is PVC wrap, which has not been considered sustainable in the past. However, it's durability and long-life cycle have made it an eco-friendly option in some studies. There have also been big strides in the manufacturing area and many of the companies manufacturing PVC wrap do have green certification, so if you are using PVC wrap ask where the foil is coming from. If you decide on timber doors, ensure the timber you are using is harvested and transported in an eco-friendly manner. If possible, use local timbers that are in abundance. Bamboo, for example, is grown in commercial plantations using sustainable forestry practices. The plants require no fertilizers or pesticides and, unlike other hardwoods the bamboo tree is not killed when it is harvested. Choose an eco-friendly top. If you decide to use timber, look at a sustainable timber option. Engineered stone is a composite of stone-fragments and resin and is considered a recycled material. Natural stone can also be seen as sustainable if obtained from a local quarry. When flown in from long distances it adds to the carbon footprint. If you wish to stick with a laminated top then look for a ‘hollow core’ top. Appliances are the largest consumers of electricity and water in your kitchen. It is in your best interest to check the energy rating that an appliance has before buying it. This green option will save you on your water and electricity bill. Finally, it is worth asking your kitchen company to quote on green options for your materials. The greater the demand, the more the prices of green products will come down. Going green is a philosophy to live by. Reduce, reuse and recycle. Take care of your kitchen to ensure its longevity, switch off lights and appliances when not in use, stay clear of single use plastics like bags and straws. Living this way is not only better for the environment but also your health and it can save you money too.